I’m struggling to think of more than one book I’ve read set in China and I suspect it’s the same one everyone else has read: Wild Swans (1991) by Jung Chang, a historical masterpiece and international bestseller published a good while ago. So much about China has changed since then including global perceptions – it’s opened up considerably and far more Westerners have travelled there, but to me it was still a huge and incomprehensible place I knew very little about. Last autumn I jumped at the chance to read an advance copy of Five Star Billionaire precisely because it’s contemporary and forward-looking. Its bluntly unromantic portrayal of life in Shanghai taps into an unprecedented level of interest, curiosity and even fear of what China is and will become – I didn’t hesitate to include it in my Fiction Hot Picks 2013. Tash Aw’s literary credentials are impressive and likely to be further enhanced by the release of this high-profile third novel. No doubt his cosmopolitan background has played a part: born in Taipei, China, to Malaysian parents he was brought up in Malaysia, moved to England to study law at Cambridge and now lives in London. The Harmony Silk Factory (2005) won The Whitbread First Novel Award, the Commonwealth Prize for First Novel and was longlisted for the Man Booker Prize that year. A second novel, Map of the Invisible World followed in 2010. Five Star Billionaire charts the fate of five economic migrants of Chinese Malaysian origin as they pursue their ambitions in Shanghai (already the world’s largest city with a population of ca. 23 million and predicted to reach 30 million by 2020). Phoebe is young, naive and materialistic, hooked on self-help books one of which is the Five Star Billionaire of the title. Gary is a popstar who has fatally tarnished his image at the height of his fame. Yinghui is a businesswoman who has sacrificed a lot to get where she is; Walter is a bigshot entrepreneur who’s not what he seems and Justin is a property magnate whose professional and personal life are in ruins. In the business of life, every tiny episode is a test, every human encounter a lesson. Look and learn. One day you might achieve all that I have. But time is sprinting past you, faster than you think. You’re already playing catch-up, even as you read this. Fortunately you do get a second chance. My advice to you is: take it. A third rarely comes your way. (Justin) continued on foot, strolling along the streets lined with low stone houses. The air was cold and sharp in his lungs, almost cleansing; the streets were busy with criss-crossing bicycles and electric scooters, merchants pulling carts of winter melons and oranges. The branches of the tree had been pruned heavily for winter, and stood sentinel-like before the handsome old European-built houses. With the possible exception of Walter, the characters have the potential to engage; they aren’t necessarily likable but more importantly they are recognisable with a mixture of qualities and flaws. The interaction between them is handled very cleverly and springs a few surprises but there’s a satisfying payback for the reader who often knows something significant that the characters don’t. Yinghui recognised a restlessness in the banker’s face, a mixture of excitement and apprehension that people exhibited when still new in Shanghai, in search of something […] – maybe it was money, or status, or God forbid, even love – but whatever it was, Shanghai was not about to give it to them. They were only interested in his fall, not his mediocrity. Only the sensational has a right to exist in the pages of modern life. This and many other observations resonate far beyond China and in many ways the novel reads like a warning. 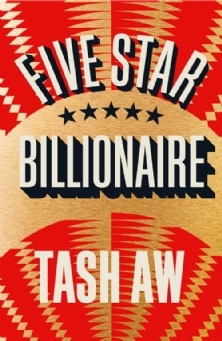 I really enjoyed Five Star Billionaire – it’s brave and provocative, well-written and entertaining. It’s also a total immersion in Shanghai, its apparently elusive pleasures and pervading harshness; I’m not sure I want to go there but I almost feel I have. I liked the tongue-in-cheek chapter titles in the style of a self-help book (accompanied by Chinese characters): Always Rebound After Each Failure, Bravely Set The World On Fire, Reinvent Yourself. It wouldn’t surprise me if this novel marks the start of a wave of literature set in contemporary China for the English-language market. It’s very different to Wild Swans in that it examines the message of one the chapter headings, Forget the Past, Look Only To The Future. Can you recommend any good fiction set in China? It would also be great to hear from anyone who’s been there, especially to Shanghai. The “low stone houses” are presumably also the “handsome old European-build houses”? In that case, clumsy duplication. If they are not, is it still the same street? Also: “The branches of the tree … and stood ” ? (Trees stand, not their branches). This should never have slipped past an editor. You may find this nitpicking, but I cannot read such texts: my mind’s eye sees what is written like a movie and if the images don’t make sense I cannot get into the story. Thanks for the comment Tom but please don’t let your dislike of that passage put you off. I really think you would find this a very interesting read. It’s very rare I read a novel, even by a literary giant, without seeing a few bits of writing which are not to my taste but sometimes it’s worth trying to put that to one side to experience something you can’t easily do another way. I have no hesitation in recommending Balzac and the Little Chinese Seamstress by Dai Sijie, a story of a journey which is the opposite of Five Star Billionaire. It’s set in the China of Mao’s cultural revolution, with the protagonists, boys from the city, being sent to a mountain village for cultural re-education (something Dai Sijie, who now lives in France, experienced himself). Balzac comes into it when the boys find a stash of 19th century european literature, as well as a beautiful village girl. It’s also short at 170 pages. Thanks for the recommendation Catherine. What an original juxtapostition, Balzac and China! Sounds good. I’m not widely read about China either, but I have visited Shanghai, once, for work about 10 years ago, and the impression it left with me was of lots and lots of people in perpetual motion; with that feeling of ‘criss crossing’ in the quotation you used, but of pedestrians, bicycles, small cars and enormous lorries. I had to have my hand held to cross the street as I was so apprehensive of the melee and the young woman from the office who was looking after me got so (justifiably) impatient! Thanks Rowena, it’s great to have an eye witness account! If that was 10 years ago, bet it’s even more manic now. Crossing the road in Cairo and Palermo totally freaked me out so I know exactly how you felt – in those places you have to perfect the thousand yard stare to get drivers to stop.